Nixon Motor Sports: Self Driving Cars Since 1975! GREAT SCOTT! The future of cars might turn out to be self driving pods that will be safer and more efficient than whatever we are all driving today, but did you know that one of the first self driving cars is still going strong since firing up in 1975? I had never heard of this either, so maybe you can impress your friends with how the Google or Apple cars of the future are really from the past! Or if that doesn't sound interesting, just go watch another "Back to the Future" marathon somewhere. At West Virginia University, they've had the Personal Rapid Transit (PRT) shuttling students around Morgantown WV for decades, and it's still going strong. The good news is that if you are a university student you can ride for free, but the rest of us would have to pay 50 cents for a trip. Sound crazy? 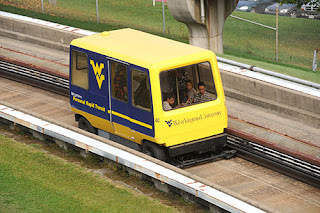 Well, about two million people ride the PRT every year, so I'd call that a huge success! While it's not a "car" that you can take anywhere you want, and it's limited to five stops around the campus and the city, well, that pretty much sounds like a self driving car to me! I don't know how I've lived all my life and never heard of this, so I thought I'd share this with you today. 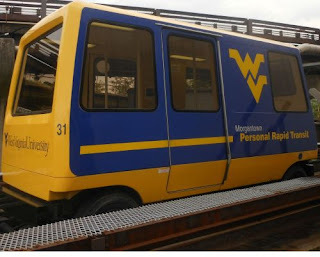 Thank goodness I had a business trip to Morgantown recently and found out about the PRT. As Yogi Berra would say, "You can observe a lot by just watching."